Is Dixie A Captive Nation? Is the South today a captive nation? Most Southerners would never consider the question—most likely because they would deem the issue to be absurd. But is it inane to ask such a question—is it forbidden in politically correct America to ask such a “confrontational” question? Conservatives would immediately dismiss such rhetorical questions as being unpatriotic or even treasonous—after all, everyone knows we live in “one nation, indivisible, with liberty and justice for all.” Liberals, on the other hand, would immediately dismiss the question by repeating two words—slavery, racist, slavery, racist, etc., etc., etc. Despite the soft-censorship efforts of both left and right to limit free discussion, the question will be asked! First: The captive nation’s former military forces were defeated by the invading nation’s military. From now on, the invading nation will be referred to as the “Empire” because most, but not all, captive nations were/are victims of Empires, such as captive nations held by the former Soviet, Nazi, Japanese, and British Empires. Liberals and most conservatives will immediately dismiss the question based upon their assertion that the South is not a captive nation because it was never a nation and therefore, by definition, cannot be a captive nation. What are the parameters of a nation? Did the South measure up to the description of a nation from 1861 to 1865? 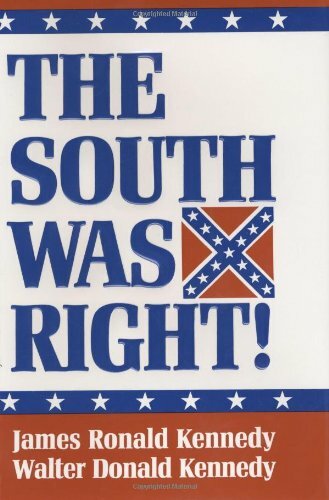 The South Was Right! James Ronald Kennedy, ... Best Price: $5.97 Buy New $18.49 (as of 11:00 EDT - Details) The historical record is clear for those who understand history—as opposed to those who blindly accept the victor’s narrative about the conflict of 1861-5. The Confederate States of America was formed by Sovereign States; it had a formal government with all the attributes of American government such as a congress, president, constitution, and flag; the Confederate Government was based upon the free and unfettered will (consent) of the voting public; the Confederacy had a military establishment; and the Confederate Government enjoyed the support of its citizens. Public support for the Confederate Government is demonstrated by taking the number of citizens who died in the struggle to defend the South and normalizing that number to the 2010 Southern population—the number of Southern deaths would equal to approximately 3.5 million. Only those who worship Lincoln and the supreme Federal Government he created would blindly assert that the Confederate States of America was not a nation. Second: After an Empire’s successful invasion, it establishes puppet governments to rule the captive nation. In 1932, the Japanese Empire set up its puppet government in Manchuria declaring Puyi the Kangde Emperor of Manchukuo. Establishing puppet governments in conquered territories is a common technique used by empires to lessen the cost of maintaining order and preventing revolts—it also gives the invasion the façade of legitimacy. The British established a puppet government in Ireland and even allowed the occupied Irish the “privilege” of electing Irish representatives to send to the British-dominated Parliament. As in all empires, the puppet master pulls the strings that cause the puppets to dance to their master’s tune. After its military had completely occupied the South, the Federal Government established “new” Southern state governments that were required to obey the will of the puppet masters in the Federal Congress. In America, “just” governments derive legitimacy based upon the “consent of the governed.” Four long years of bloody conflict proves that the Southern people were no longer willing to give their consent to be governed by the Federal Government. These Federally established “new” governments were based not upon consent but upon military and political coercion. Therefore, any American government based upon coercion is illegitimate—it is, in fact, a puppet of the coercive power that installs and maintains it. Voting in elections does not bestow legitimacy (consent) upon these governments any more than the fact that the Irish were allowed to vote for Irish representatives to send to the British-dominated Parliament bestowed legitimacy upon the British Empire’s occupation of Ireland. Should We All Bank With the Fed?